Are we sick of the obligatory autumn leaf toss pic yet? :P I couldn't help myself when I saw this field of perfect crunchy orange leaves in Millenium Park. Chicago was great. We had a pretty lazy trip overall and didn't cram too much in. Sometimes that's just the way to do it. Updates to come! love love love! hope you guys had a great trip... CANNOT WAIT to hear more about alinea! I love this! I still need to take autumn-y pictures! that's a terrific shot! im in love with the colors! Lovely shot indeed. Autumn hasn't shown up here in Spain yet, so keep these photos coming. I love the colors here and you in such a bright mood! 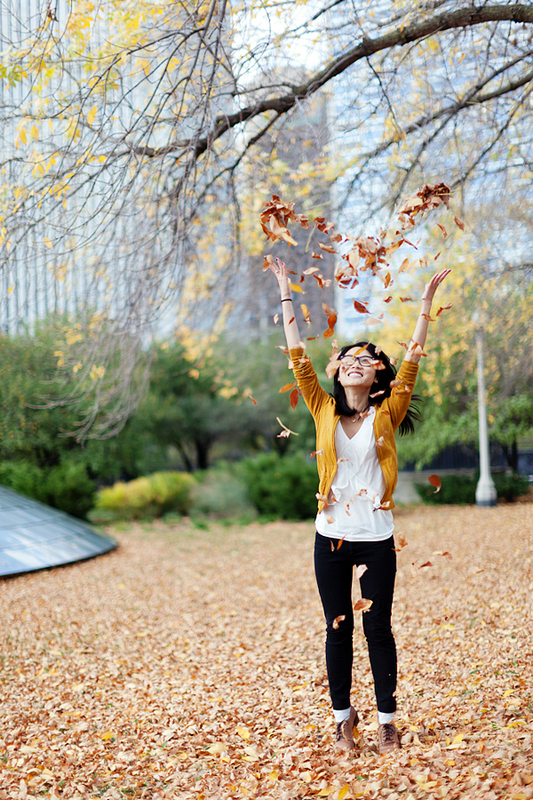 Great toss :D and your outfit is perfect for the autumn setting! I love this picture, Alice! It's amazing how, despite being on the opposite sides of the world (I'm writing from Italy), we all took the leaf toss pictures :D The crunchy leaves are just too cute to be left on the ground without a picture!! Gotta say, those leaves look awfully irresistible! Hope you guys had a blast over there. Keep the photos coming! So cute! Totally not sick of them yet. Can't wait to hear more about your trip.